Branson SFX550 Digital Sonifier, 550W 20Khz, w/3/4" Horn, 101-063-968R. Branson's most powerful Sonifier�, the SFX550 easily handles high-volume applications with up to 550 watts of output power at 20 kHz. The SFX550 can process larger, viscous samples, but also provides precise control over energy output and other parameters to accommodate experiments of all sizes. All SFX Series Sonifiers provide exclusive Branson features including advanced energy mode and true temperature control. All SFX Series Sonifiers feature a digital, intuitive interface flanked by easy-to-use pushbuttons. The screen and buttons provide one-touch access to all control parameters and modes of operation. Advanced control modes. In Energy Mode, the SFX Series power supply manages the processing cycle to deliver a precise, user-determined input of ultrasonic energy (measured in joules), either continuously or pulsed. The SFX Series automatically compensates for any variability, extending or shortening the cycle as needed to deliver the precise energy output. True temperature control. (Requires separate temperature probe.) With true temperature control, the SFX Series power supply maintains the temperature of the sample to within a user-specified range, automatically adjusting the ultrasonic pulse length to regulate the temperature rise and prevent overheating. Sample-processing programs. For assured repeatability and precision on a greater scale, the SFX Series enables users to create and store up to 20 sample-processing programs. Program parameters include continuous or pulsed ultrasonics; time, energy, or temperature control modes; pulse on-time/energy, off-time, and total on-time/energy; or amplitude as a percentage. 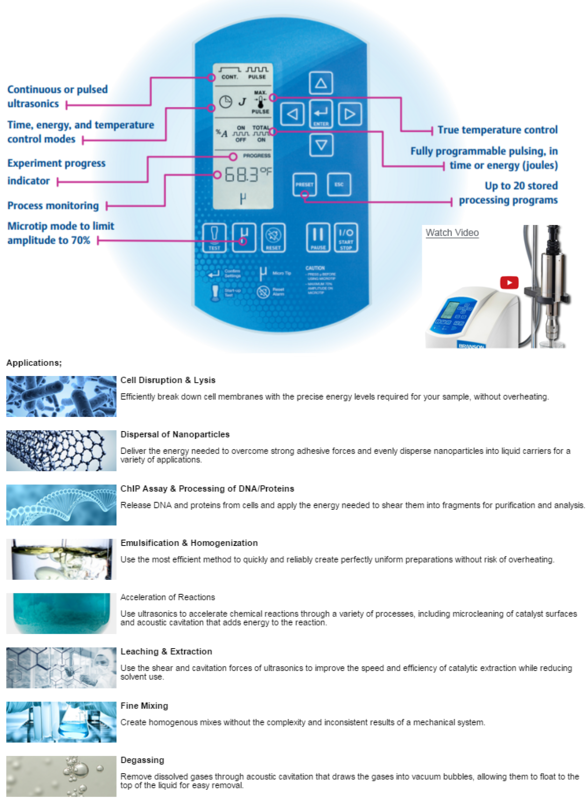 Cell Disruption & Lysis; Efficiently break down cell membranes with the precise energy levels required for your sample, without overheating. Dispersal of Nanoparticles Deliver the energy needed to overcome strong adhesive forces and evenly disperse nanoparticles into liquid carriers for a variety of applications. ChIP Assay & Processing of DNA/Proteins Release DNA and proteins from cells and apply the energy needed to shear them into fragments for purification and analysis. Emulsification & Homogenization Use the most efficient method to quickly and reliably create perfectly uniform preparations without risk of overheating. Acceleration of Reactions Use ultrasonics to accelerate chemical reactions through a variety of processes, including microcleaning of catalyst surfaces and acoustic cavitation that adds energy to the reaction. Leaching & Extraction Use the shear and cavitation forces of ultrasonics to improve the speed and efficiency of catalytic extraction while reducing solvent use. Fine Mixing Create homogenous mixes without the complexity and inconsistent results of a mechanical system. Degassing Remove dissolved gases through acoustic cavitation that draws the gases into vacuum bubbles, allowing them to float to the top of the liquid for easy removal. High efficiency, stand-mountable converter requires no internal cooling. In-process feedback displays experimental progress together with key variables such as power level, energy usage, and sample temperature. Up to 20 stored programs. Programmable parameters include continuous or pulsed ultrasonics; time, energy, or temperature control modes; pulse on-time/energy, off-time and total on-time/energy; or amplitude as a percentage.